Manchester City held on for a hard-fought victory over Everton to make it three from three at the start of the FA Women’s Super League season. 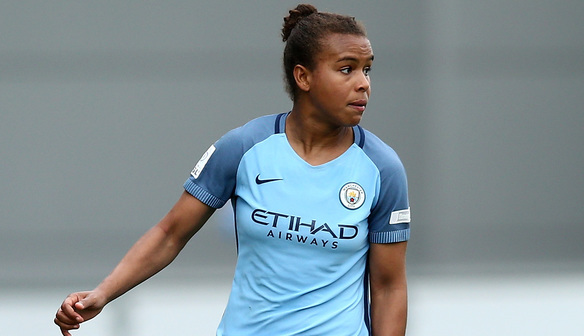 Pauline Bremer notched her first goal for the club after excellent strikes from Steph Houghton and Nikita Parris had overturned an early Claudia Walker stunner. Simone Magill brought Everton back into contention midway through the second half but City held on to extend their 100 percent start to the season. Everton took an early lead as Walker picked up the ball 25 yards out from goal and sent an unstoppable strike into the top corner, leaving Marie Hourihan with no chance. City were back on terms less than ten minutes later as Houghton’s free-kick was too powerful for Elizabeth Durack before Parris headed the visitors ahead from the restart. The champions soon added a third with Parris turning provider and Bremer heading past an onrushing Durack. Megan Campbell nearly extended the lead further with an in-swinging freekick but it rebounded off the crossbar. Bremer unfortunately had her game ended with just over half an hour played as the German picked up a suspected leg break. Parris forced a strong save from Durack as the game entered ten minutes of first-half injury-time before Hourihan parried away Olivia Chance’s low drive at the other end. Magill stabbed home a loose ball from a free-kick as Everton cut the deficit to just one goal again, but the visitors held on for the points despite the Toffees’ determined efforts. Everton forward Courtney Sweetman-Kirk said: “It’s a hard one. We’ve increased our performance from Birmingham and not many teams will do that to Man City in terms of the way they played. “They’re not normally a team that concede goals so in that way it’s a positive but in the same breath we’re a team of winners and we’re disappointed that we didn’t come away with something. “We feel like we could’ve nicked a draw with our performance, it’s nothing less than we expected, we’ve switched off for five minutes and we’re 3-1 down. “That’s the difference from WSL 2 to WSL 1, you switch off and you get punished. “Looking at the run we’ve had – Liverpool have won the WSL twice, Birmingham we were disappointed with but are a solid side – we’ve had a tough run of it but there’s a lot to build on. Man City manager Nick Cushing added: “[On Pauline Bremer’s injury] – no I haven’t had an update. The process for us at Manchester City is to leave the medical team to their work. “We’ll get the update when we get it but like everyone’s saying, it doesn’t look good. “When things like this happen football doesn’t mean a lot – but actually in the moment, the players have done their job. “We’ll all get around Pauline now and make sure she’s ok, as a team, we’ll stick together, we’ve done it before and we’ve done it again. “I was really pleased with the way they stuck at it in a really difficult game against a really tough Everton team. “We seem to have these clusters of goals where we’ve got momentum. Substitutes not used:Ellie Roebuck, Esme Morgan, Ella Toone.